Derby High School wasn’t too kind to the Salina Central Mustangs last year. Not the case for 2018-19. 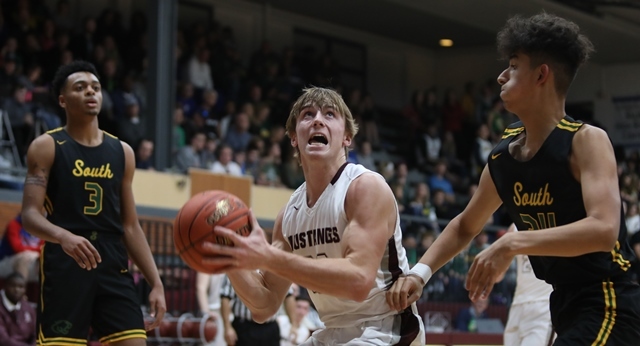 Harper Williams splashed in five threes, Salina Central skunked Derby in the third quarter, and the Mustangs rolled to their third straight win, 61-40, over the Panthers Tuesday night. The streak comes after back-to-back overtime losses two weeks ago. Williams set the tone early, knocking in two treys to push Central out to an early 8-3 lead. After falling behind 13-6, Derby (4-13, 2-8 AVCTL-I) countered, knotting up the score at 15-15 with 2:17 remaining in the opening frame. Central (13-4, 6-4) closed out the first period on a 7-0 spurt that allowed the Mustangs to balloon the cushion out to 34-23, but the Panthers cut the deficit to 34-30 at halftime, following a 7-0 run of their own. Salina Central took control for good in the third period, outscoring the Panthers 17-0. A switch to the 2-3 zone proved to be effective until Derby senior Clayton Hood drilled a three to open the fourth, sparking a 7-0 blitz. Central senior Brogen Richardson calmed everything down, hitting a trey for Central’s first bucket of the quarter with four minutes to play. Richardson scored 13 points while Williams poured in 19. Senior Ben Driver chipped in nine for the Mustangs, who head to top-ranked Maize Friday. Pregame at 5:45 on Sports Radio 1150 KSAL. Despite falling behind 9-2 early, Salina Central never backed down from the top team in Class 6A: the Derby Panthers. Central (10-7, 6-4) trimmed an 11-point margin down to five before Derby recorded the final bucket of the first, settling with a 19-12 advantage. Derby (17-0, 10-0) tried to pull away in the second, but Oregon State commit Kennedy Brown was forced to sit with two fouls. The Mustangs took advantage, outscoring the Panthers 7-2 to go into halftime down 33-24. The defending 6A champions had enough in the second half, suffocating the Central offense, giving up just one bucket, a Kadyn Cobb three in the third, in the second half. Derby outscored Central 31-6 in the final 16 minutes, pushing its win streak to 40 games. Brown finished with a game-high 20 points while Missouri State commit Tor’e Alford added a season-best 17 points. Freshman Aubrie Kierscht led the Mustang attack with nine points.